at the March 4th Boulder City Council meeting (we'll let you know if there's a change). Please come to March 4th Council meeting to support your fellow dog guardians in speaking out against these extreme proposals and consider speaking at the Council meeting yourself. The more people that Council hears from, the better our chances are of stopping the implementation of these proposals, or at least reducing their severity. The most extreme of the proposals involves the loss of your Green Tag for a single offense of chasing wildlife, even a squirrel into a tree, ANYWHERE in the city of Boulder. In addition, your dog is expected to come IMMEDIATELY when called. Two violations of this "offense" will result in the loss of your Green Tag. No other user group faces loss of open space privileges for committing any offenses, on or off of open space. Dog guardians should not have to face a double standard. Please come to the Council meeting to voice your concerns on the proposed Green Tag changes. Wear your dog leash to show that you are representing the dog guardian community. If you are unable to attend the March 4th meeting, please write to City Council at council@bouldercolorado.gov. Or better yet, write to Council AND attend the meeting. Spread the word among your dog guardian friends, as well. If you have any questions about this Council meeting, or speaking or writing protocols, please email FIDOS at info@fidos.org. FIDOS has written some alternative proposals. Please read more below. an outpouring of discontent among the dog guardian community. As an expression of their deep discontent with OSMP's current proposal, nearly 1200 people have signed a petition asking to leave the Green Tag Program unchanged. OSMP is unnecessarily attempting to punish the majority of dog guardians for the infractions of a few. Simply stated, OSMP's proposed changes are unfair. OSMP has gone over the top in targeting the single user group of dog guardians with these costly, complex, and excessively punitive proposals. None of the other "overarching issues" from the West TSA has received a fraction of the attention that OSMP has devoted to drastically altering the Green Tag Program. FIDOS has additional concerns about the $734,000 price tag, for just the first year, needed to implement OSMP's proposed Green Tag Program changes, then followed by a $135,000 ongoing annual cost. Considering the minority of infractions with the current program and the unsound scientific methods that OSMP has used to collect and analyze their "compliance" data, this cost is excessive and unnecessary. This money could perhaps be better spent on building new trails. OSMP produced a complex 23 page document on June 18, 2013 to outline their proposed changes. In contrast, FIDOS is proposing a straightforward, education-based, as a manageable approach to modifying the Green Tag Program and outlined below at this link. In the spirit of showing good faith, FIDOS is willing to make concessions with some of the OSMP proposals, such as increased fees, increased fines, and verification of rabies vaccination. In return, we ask that our concerns and counter-proposals are heard. Listed below are the Green Tag Program changes that OSMP is proposing. This list comes from Attachment A of their June 18, 2013 memo as the final proposals will not be available till Feb 28th, just four days before the meeting, however, we have been told that the final proposals will be close to his document. FIDOS' concessions, concerns, and alternate proposals are color coded following each proposal. 1) Require all program participants attend an information session. New program participants must attend a session before they can register in the program. During the first calendar year (2014), existing participants may remain active in the program and will have until Dec. 31, 2014 to complete the information session. The information session must be repeated every five years. 2) Require proof of current rabies vaccination for all dogs to be registered in the program. - City of Boulder residents are required to provide a valid City of Boulder dog license as proof of current rabies vaccination. 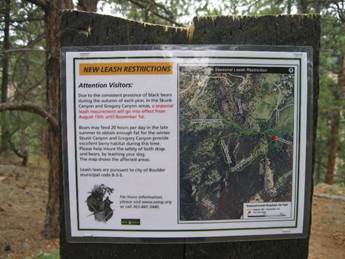 - Require that all dogs on OSMP lands display a valid rabies vaccination tag. FIDOS accepts this proposal. We believe that education, outreach, and peer pressure to do the right thing are the true solutions. convictions respectively. Provide mechanism for dismissal of tickets for lawful participants who inadvertently failed to display tag. (B.R.C. 8-3-3) will be increased to $100. Encourage courts to order such additions to fines as watching the voice and sight video, attending the voice and sight information session, dog training, and/or demonstration testing for egregious or repeat dog-related violations consistent with the nature of the violation. Community service for dog waste violations may be particularly appropriate. 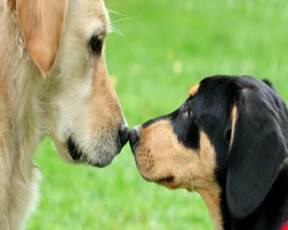 FIDOS accepts that increased fines and community service can help to serve as deterrents to committing offenses among well-informed dog guardians. Convictions of Aggressive Animal Prohibited and Failure to Protect Wildlife violations on OSMP and other lands under the jurisdiction of the City of Boulder will be cause for revocation. First, FIDOS opposes loss of Green Tag privileges for any single offense, other than when physical injury or death occurs. As mentioned previously, no other user group faces loss of open space privileges for committing any offenses on or off of open space. Dog guardians should not have to face a double standard. The language of BRC 8-3-5 (Failure to Protect Wildlife) could easily result in the loss of Green Tag privileges if a dog would merely chase a squirrel into a tree, or if birds would fly off at the appearance of a dog (or even people). This blanket one strike punishment is too extreme. 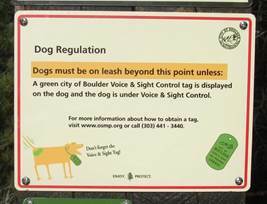 Second, FIDOS strongly opposes the provision that one strike of Aggressive Animal Prohibited or Failure to ProtectWildlife anywhere in the City of Boulder would cause loss of Green Tag privileges. This proposal unfairly punishes the residents of Boulder relative to residents of other communities. If a Boulder resident's dog flushes a goose at Viele Lake, this guardian would lose their Green Tag. Meanwhile, dog guardians living outside of Boulder city limits face no equal penalty in the areas where they reside. FIDOS feels that Green Tag penalties should only be applied in areas where the Green Tag is observed. Dog at Large (B.R.C. 6-1-16) except for voice and sight control violations where the guardian doesn't possess a leash. Violations of City Manager's Rule (B.R.C. 8-3-3) involving wildlife protection and a dog being off leash. Revocation of program privileges applies to the preceding violations on all OSMP lands and other City of Boulder properties where voice and sight privileges are recognized. FIDOS opposes 2 strikes in 2 years as a punishment resulting in loss of the Green Tag. Again, climbers do not lose open space privileges if they violate a seasonal raptor closure, regardless of the number of times they may violate this rule. 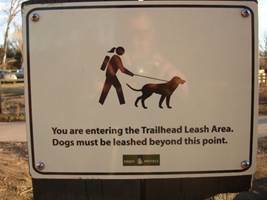 Hikers do not lose open space privileges for hiking on closed trails, or for creating social trails. People do not lose open space privileges for harassing wildlife while trying to take that perfect photograph. FIDOS feels that the high cost of the increased fines is a sufficient deterrent that is consistent relative to all other user groups. All other user groups face only fines as a deterrent. 7) A guardian with two revocations in three years or three revocations will lose privileges for a period of time determined by the courts and may thereafter apply for reinstatement. FIDOS feels that this rule is an added and unnecessary complexity to an already complex set of proposals. 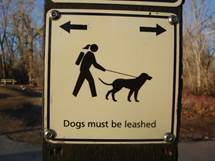 8) Require a minimum fine of $300 and a minimum one-year revocation period for a guardian with revoked privileges having a dog off leash. 9) Program privileges may be reinstated after successful completion of a reinstatement process. Reinstatement from revocation must include successful completion of the voice and sight evaluation test by the revoked guardian and dog and the retaking of the information session by the revoked guardian. Reinstatement will include payment of fees for the voice and sight evaluation test and payment of reinstatement fee. FIDOS requests further clarification on the pricing scheme for reinstatement of the Green Tag. We have concerns that the combined cost of the initial fines, the reinstatement testing, and the additional information session may make reinstatement of the Green Tag a cost prohibitive process. - Non-Boulder County residents ($75). The registration fee includes one guardian and one dog; the fee for each additional guardian in a household is ($5) and the fee for each additional dog in a household is ($10). - Non-Boulder County residents ($30). The additional guardian and dog registration fees will be waived for City of Boulder households who meet income criteria consistent with the City of Boulder Food Tax Rebate Program or the Parks and Recreation Reduced Rate Program. FIDOS accepts the increased fees. We accept the waiver of the additional guardian and dog registration fees for low income families, although we still have some concern that the initial program registration fees and the annual renewal fees may be somewhat prohibitive for low income families. OSMP has produced a complex 23 page document to outline their proposed changes. In contrast, FIDOS is proposing a straightforward, education-based, and manageable approach to modifying the Green Tag Program and outlined below. 2. Provide more opportunities for education and outreach to the Green Tag community. 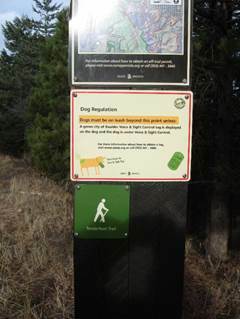 Examples include sending periodic refresher emails to Green Tag holders, supporting a volunteer effort to educate dog guardians out on the trails, and requiring interval attendance (perhaps every 5 years) at the information session for further reinforcement of the Green Tag rules. FIDOS also supports upgrading the Green Tag on-line video, providing that the upgrade costs can be covered by the Green Tag fees. 3. FIDOS only supports revocation of the Green Tag for aggressive dogs who cause physical injury or death. No other user group faces loss of open space privileges for committing any offenses on or off of open space. 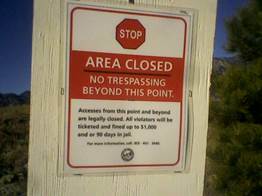 Climbers do not lose open space privileges if they violate a seasonal raptor closure. Mountain bikers do not lose open space privileges for biking on a trail closed to bikers. 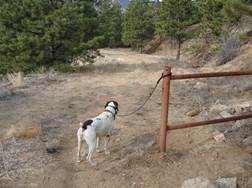 Hikers do not lose open space privileges for hiking on closed trails, or for creating social trails. People do not lose open space privileges for harassing wildlife while trying to take that perfect photograph. Dog guardians should not be unfairly targeted with the harsh punishments outlined in OSMP's proposals, which would even include Green Tag loss for a single offense of chasing a squirrel into a tree. Open Space and Mountain Parks has created a electronic newsletter which will address issues and stories from the Open Space. You can sign up to receive the newsletter <at this link> and we encourage all members of FIDOS to sign up and stay informed on whats going on in the city. The first edition will have a story about how local wildlife is affected by the flood and an article about motion-detecting cameras in the Open Space. Thanks to those who attended the Boulder Rez Public Workshop on the Boulder Reservoir Master plan on Jan 22 and reported back. There doesn't seem to be much which would impact the V&S access discussed, the boaters and those who used the Rez for Commercial Events were out in force and there was a lot of discussion about access and the country road on the East side of the Rez. It was interesting to see that the vast majority of people who visit the north side of the Rez and Coot are there with dogs. The area is certainly a "highly valued V&S area", though the study considered it "degraded". Just need to keep an eye on this incase they decide to "improve" the degraded area by restricting V&S. Its surprising how much V&S activity is going on the Boulder and the County which FIDOS members try to cover. If you'd like to help out, but cant make long term commitments, we are pulling together a list of volunteer activities which simply involve turning up. For example, organizing a social event or attending an OSBT or Council Meeting and reporting back. (These meetings may seem dry, but when you have some skin in the game, such as preserving V&S access, they can be fascinating). Let FIDOS know if you are interested in these ad-hoc activities and we'll put you on the mailing list. Members of FIDOS include a wide cross section of the Boulder Community, the common factor being an interest in enjoying and protecting the the Open Space, accompanied by our dogs. Many supporters are in fact "between dogs", but value meeting others with their dogs on the trail. In order to retain and expand this access we each need to be "good stewards" of the lands around us and keep an eye on whats going on on the trails as well as in the meeting rooms. Let us know if you have any ideas or observations on the direction of FIDOS. New perspectives on V&S are always valuable in developing our arguments. FIDOS meets on the first Monday of each month, 7pm Location TBD. The agenda is always published in advance to make sure we hit all the issues. If anyone would like to address the group let us know in advance (mail here) and we'll make time in the schedule.